When Francophiles Don and Mindy Wallace received an offer for a house on a tiny French island, they jumped at the chance, buying it almost sight unseen. What they found when they arrived was a building in ruin, and it wasn't long before their lives resembled it. Plagued by emergency repairs, a stock market crash, and very exasperated French neighbors, the Wallace's could have accepted their fate. Instead, they embraced it. The French House is the delightfully amusing and picturesque memoir about a family who seized life, rose from the rubble, and built themselves a home away from home. This was one of those cases when I expected a different book than I actually got. From the above summary, I thought I was going to get a French twist on The Money Pit. There are definitely elements of that in this book, although not in the same slap-stick vein. But, instead, this is really a love story that an American couple has about a way of life. Don and Mindy Wallace are what others may call Bohemians--although they would probably use another word to describe themselves. In the midst of living a paycheck to paycheck Spartan lifestyle in New York City, they buy a ramshackle ruin in a town on an island off the coast of Brittany. I have to admit that I was a bit taken aback by their financial choices, I do think that my reaction actually made this book more interesting to read. However, while there is a fair amount about their purchase and the work in entails, the real heart of this book is the village and its people. Wallace skillfully brings to life the villagers in a way that is somewhat reminiscent of Garrison Keillor and his Lake Wobegon. But this book is essentially French. Wallace pays a great deal of attention to the French--especially the Belle Isle--way of life and how it differs from the American, or even the mainland French way of life. I do feel that you have to read this book in a leisurely way, as if you yourself were on Belle Isle. This is not a book to rush through--it is a book to savor. The beauty in Wallace's writing is in the details and you won't catch them if you are trying to push yourself through this book. His descriptions of the island are breathtaking--and accurate! After I finished this book, I googled pictures of Belle Isle and it was exactly as I had imagined it while reading this book. My only complaint is that it did take me a chapter or two to really settle into this book. In fact, I found the first chapter to not really fit with the rest of the book. But, if you read past the first chapter (which I hope you will), you will find a delightful portrait of a quaint place unlike any other. 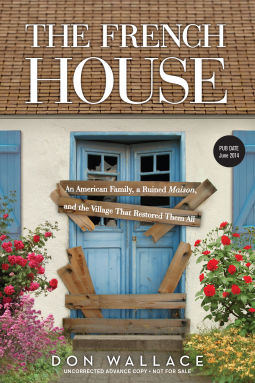 Thanks to the publisher, Sourcebooks, I am giving away one copy of The French House by Don Wallace to one of my readers! This enter runs until 11:59pm on Sunday, June 8th and is open to residents of the US and Canada only (no PO Boxes, please). To enter the giveaway, please fill out the Rafflecopter questionnaire below.